Olivia Skelton, with her parents Wes and Tina Skelton, accepted the Franklin B. Walter All-Scholastic Award presented by the OESC Association in Columbus. CONVOY — Olivia Skelton, from Crestview High School, was recently honored as the Franklin B. Walter All-Scholastic Award winner for Van Wert County. She was chosen based on academic achievement, personal accomplishments and community service. 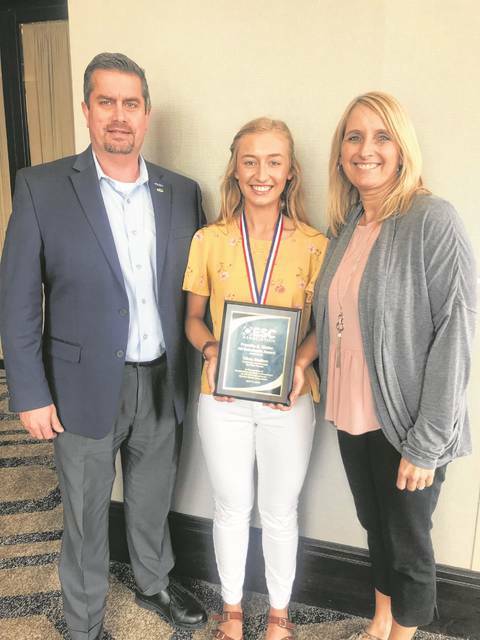 https://www.limaohio.com/wp-content/uploads/sites/54/2019/04/web1_Skelton-orig.jpgOlivia Skelton, with her parents Wes and Tina Skelton, accepted the Franklin B. Walter All-Scholastic Award presented by the OESC Association in Columbus.